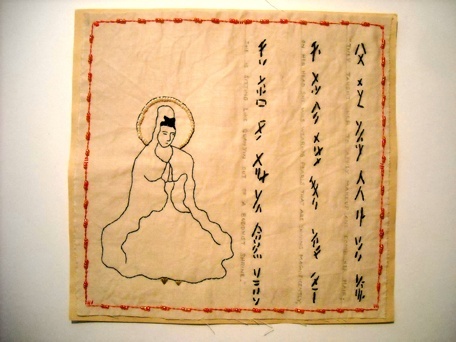 Nu Shu was a secret language developed by women and embroidered on handkerchiefs and fans and exchanged between friends to express their pain and sorrows. It was a fluid and curvilinear interpretation of the more geometric Chinese characters. In ancient China, women were denied classical education and, in order, to communicate with one another, ingeniously, invented "nu shu" or "women's writing". The inscription on the fan translates: "They taught her to apply makeup and comb her hair; on her head she was wearing pearls that are shining magnificently; she is sitting like Guanyin** out of a Buddhist shrine". **Guanyin is the Chinese goddess of compassion and mercy.